Larry Bodine, Blog for Arizona contributor, has done a heroic job of reporting on various forums and candidates in the 2018 race. In his latest post, he reports on a CD2 Democratic contestants face-off, concluding that Kovacs Shines and Kirkpatrick Gets Booed at CD2 Congressional Candidates Forum. Here are snippets from his review. The CD2 Congressional candidate forum on July 19 was a classic Democratic assembly, with at least 450 attendees including hecklers, cheering and booing, and horrendous audio. 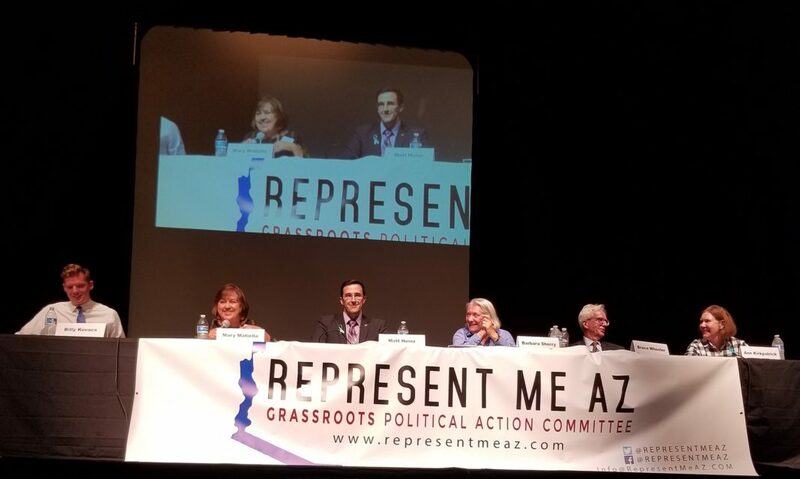 The PAC RepresentMeAZ organized the event at Tucson High School and gave out report cards about the candidates. The results will be posted soon on Facebook. At the last event, Bruce Wheeler was the crowd favorite, and I’m guessing this time it may be Billy Kovacs. Kovacs, Maria Matiella, Bruce Wheeler, Barbara Sherry and Matt Heinz staked out ultra-progressive positions, leaving a beleaguered and defensive Ann Kirkpatrick as the odd person out. So, you see, the ordering of the candidates in the photo was predictive: from Kovacs at left to Kirkpatrick at right. All the candidates agreed to support the winner of the August 28 primary. Mail-in ballots will be sent to voters on August 1. The audience groaned as Kirkpatrick and Heinz sniped at each other. See videos and attack ads in the comments section at https://goo.gl/6QtjfH. I have no tolerance for candidates who go negative against fellow Democrats. All the candidates supported federal legalization of marijuana except Kirkpatrick. Why, Ann, why must weed be outlawed as a Schedule 1 drug? All but Kirkpatrick supported Rep. Adam Schiff, D-Calif., the ranking member of the House Intelligence Committee, for calling the president’s remarks “cowardly and shameful” when he bowed to Putin. Regarding impeaching the president, supporters were Kovacs, Matiella, Sherry, and Kirkpatrick — but not Heinz or Wheeler. Most of the candidates wore teal ribbons for Sexual Assualt Awareness. The unspoken issue is who can beat Republican Congressional favorite Lea Marquez-Peterson, who has amassed a war chest of $509,067 of cash on hand. Money matters in an election and Kirkpatrick has $836,927 in cash and Heinz has $493,797 in cash. Read Kirkpatrick & Heinz Lead in CD2 Congress Fundraising, Marquez-Peterson Catching Up. The GOP considers Kirkpatrick to be the front-runner. But that didn’t matter to the partisan crowd at the candidate forum. Kovacs appeared to connect with the audience, drawing repeated applause, especially for opposing the militarization of the Mexico border. I have to pause and ask, as did a commenter on this post, about all the non-Giffords victims of gun violence before Gabby got shot. What was the philosophical, spiritual, and/or political foundation for Kirkpatrick’s position before January 2011? Liza commented on Bodine’s post as follows. I won’t enumerate all the disagreements I have with Ann Kirkpatrick’s answers. Suffice it to say that I see her as Republican-lite. But I have to say that I was actually surprised when she brought up her “reason” for switching from an enthusiastic NRA supporter to whatever she is now. Her sudden enlightenment on this issue occurred when her friend Gabrielle Giffords got shot. It finally happened to someone she knew. I would have thought that AK would have stopped saying this by now, but apparently she is unaware of how offensive it is. It is as though all the people who got shot before Gabrielle Giffords didn’t matter to her. Good grief, how can anyone be so tone deaf and so insensitive? I really hope she loses this primary. I agree with Mr. Bodine that Billy Kovacs is likely to be voted the crowd favorite this time. He’s a very charismatic young man, has good progressive values, and he gave several thoughtful, well-articulated answers. If he were to make it all the way to Washington DC, I think CD2 would be just fine. It’s interesting that Billy sat at one end of the table and Ann Kirkpatrick at the other, because they are polar opposites in many ways. Quite frankly, I see no reason to vote for Ann Kirkpatrick and not just because she’s an outsider handpicked by the Democratic leadership.